Even blankets have been washed and line dried! I went to Newport today and had no problem buying diesel. No silly queues either! They had run out of unleaded petrol and gas. Then back for lunch with The Carpenter before he left for Cambridge and a cycle polo tournament. With any luck The Wizzard will be there with a team from Manchester. I worked out a new small bowl shape, as the soup bowls finished drying in the sun. The bigger bowls are nearly dry too. I only threw four as my hands are aching a bit and need a rest! It was still pleasant weather after tea so I went to the velodrome by bike instead of using the car- an hour to go there and an hour and a quarter to return, after a couple of hours there. I'm back there again tomorrow, helping to run an event... I think I'll have a day off and go by car!! Started today with yet more washing....The Oily One is having a sort out, gradually!!! AT LAST!!!! Then a pleasant walk to the next village to tax the car...£215!!!! However it is still doing 45 to 50 mpg so I can't complain. Buying fuel might be a problem however as the P.M.'s "don't panic"...has meant that many have done just that. Good incentive to use the bike!! After a coffee break I set to on stencil cutting as the soup bowls dried in the sun, then turned and decorated them. At about 2pm I could see the wind changing from Southerly to Northerly...the clothes flapped in the opposite direction and made moving shadows over my work! Lunch was late as I thought it better to keep the flow of work going and finish these bowls. After that there were two larger bowls and a dish to turn. One bowl is now a colander. It is more work, but fun! Yesterdays bowls were only just soft enough to "pie crust" the edges first thing this morning. Last night they were too soft to turn over!! Back along the towpath to Risca for shopping, it was a beautiful day to be out on the bike. Even with both panniers as full as they would go!! I must admit I did walk up " Factory Trip", the steep little kick up into the village. Now refreshed it is time to get back in the workshop for a while...soup bowls to make next. We're still having air from the South, so the days are getting warmer while it lasts. The nights show the true weather as in some places it drops nearly to freezing point. Mugs and jugs done and dried, as is the washing!! Now I'm making bigger bowls and plates in between getting the bread and supper baked. More pie-crust rims I think, as they show well in the darker glazes. The official announcement came today- first class postage stamps are up from 46p to 60p next month, and the "simplification" of the parcel and small packet rates will hit hard. I know we may still have average postal rates after this, but a rise of these proportions hurts. I tried to throw a couple of trial shapes yesterday, but things were just wrong. Moral. Don't start when you're tired, and don't start without centreing yourself. Today , after turning the clocks forward, cleared from a misty start to a warm day. The days may be unseasonably hot but the nights are not, and the workshop was decidedly cold! Once the sun was on the roof life improved and I started by putting clay on boards to dry and kneading clay for today's throwing. I had a few shape false starts and ended up with a nice bellied mug and jug shapes. These will have stencilled words (coffi, te......) They sold well before and I have someone already interested in them. They will also fit nicely round some more bigger bowls which need making. It is a good thing that warm and dry weather has been forecast for two more days! I need to work out a stencil for a bike tyre track , for an order. Also one for a Celtic design with horses, ordered a while back, luckily by a customer who is willing to wait!! I dug over, added compost and manure and planted a new strawberry bed!! The sun brought out most of the gardeners on the allotments. out on the bike at last! It is forecast even warmer tomorrow, possibly topping twenty degrees. I think it is quite nice as it is, thankyou!! Although I did curse The Carpenter for "borrowing" my smallest chainring for his polo bike as I walked up the first half of the Fourteen Locks climb and rode the rest at a crawl!! Now I have a batch of bread dough mixed and waiting to be kneaded. 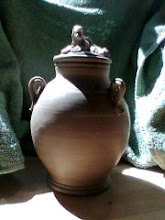 Then it is time to plan out the next lot of pot making. I have two orders outstanding, a large mug and a stencilled plate. I need to make more platters and bigger bowls. A better range of coloured slips needs to be worked on too. I've been offered slips and glazes by a potter who is giving up saltglazing and staying with white earthenware. A marvellous gift and an incentive to get the next saltfiring to happen! I'm cursing The Wizzard too.. now he doesn't know when he'll be here again to finish sorting our laptops and computers. Gah!!! to housework!! Dealt with with help from The Carpenter, who has been very busy! Twins Club in Aberystwyth was good fun- only four sets this week! Two hours where they charge around a large church hall!! The pot deliveries went well, and I returned with no pots in the car!! The next time The White Room Gallery in Harlech need stock they'll arrange to meet me in Aberystwyth, and can take work for Maentwrog too...as well as having a day out themselves. It was a lot of driving, although only 175 miles in the one day. I stopped in Porthmadog for a break and a wander round the town. It was good to see The Grapevine Bistro still going strong!! (good excuse for a fresh coffee!) Browsers Bookshop too and Rob Piercey's Gallery. However when I looked at the old Flour Mill (Snowdon Mill) where I worked as a potter/designer, it was derelict again. All the money, grants, hard work gone to waste. It had been a good centre for tourist activities, a shop selling work from craftspeople in Gwynedd, a cafe, large gallery, rooms for meetings and courses.....work for local people. Now it has been boarded up by order of the council for safety as has the mobile office of the company that was intent on converting the six storey building into flats, starting at £240,000. Wednesday was a Day for Me..in Welsh, "Diwrnod i'r Brenin", literally a Day for the King!! I started for home soon after 7.30 this morning, driving through the misty mountains with the promise of a pleasant day. In some places the water was seeping out from damp slopes above the road, but in most places little dust devils rose and swirled every time a vehicle drove past a field gate or lane onto the road. I'm not sure if the saying "Mawrth, Llwch. Ebrill Llif" ( March, Dust. April, Flow, ie rain) will be correct..we just needed the Winter rain that we haven't had. The sun came out as I made a stop in Hay on Wye to see how the market is doing and talk to friends. Not as busy as it should be, but still going well. Mostof the red pots fired well- a couple overfired....ones I wanted for this order, naturally! There are spares, fortunately. Now I'm busy being Nan! It is beautiful weather, we've all been to the playground and for a walk. Twins Club in a minute! Tomorrow is delivery day for pots to Conwy and Harlech!! the floor had to be painted anyway, so it is just as slippery. I just curse your "helpfulness" a little every time I have to clean the darn thing!! I just didn't have the time or the heart to get you to put a smooth surface on it! I'm sure it must be good exercise, going from this computer on the first floor, down stairs, out to the back yard and down the stairs and along the path to the workshop (and back) every 15 to 30 minutes!! The firing is coming along nicely and I think I've timed it nicely to be able to leave it for an hour to go to the allotment committee meeting. How many of us write round and around what we are really feeling? Almost ten months now and I feel dreadfully alone in some ways. I wear a piece of jewellery we found together, to give me strength. The touch of it is reassuring. I'm working hard at the pots but sometimes can't see which direction I'm heading in. I don't know which direction to head towards, especially in these "interesting times". Be true to yourself. Find who you are. Don't let someone else change you because what you are is not what they want. Be professional. If a mistake has been made, fine, admit it, move on. I'm looking forward to the Vernal Equinox on Tuesday. More light. Duty day at the gallery completed , I headed straight for home, going over the end of the mountain to avoid the traffic. Any excuse! Just driving over makes me feel easier but it is high time I got up there on foot. The platters fired well, although I think that I was about ten degrees too cautious for the top two, and the bottom two would have taken that fine. You live and learn! Glazing the next kilnful took three hours or so, by which time I'd had enough . My laptop arrived this morning, thanks to my brother. The Wizzard will be down here again soon then it will be time to install everything and be launched on my very own computer!! Brother was on a mission to a certain large Swedish shop, and disappeared after a quick cuppa. Then it was (literally) gloves on and set to with fettling all the red glazed pots and packing the kiln again. The iron oxide in the glaze stains skin and I'm sure doesn't do skin any good. Wearing the latex gloves made the smoothing of any pinholes and dribbles much easier too. Now the overalls are ready to hang on the line and I've had lunch...time for some gardening at long last. Firing the kiln can wait until tomorrow!! On duty again today! I hope this mist and fog isn't around Abergavenny too. I've peeked in the kiln....looks good so far...I'll be madly unpacking, glazing and repacking as soon as I get home again! On Monday the sheep heads were done bright and early. Which is more than can be said for the weather...it was foggy and chill, so I went by the steep lanes from Risca via Lisvane to St Ffagan. It was still cloudy when I finished there, but gradually lifted as I drove home, then suddenly by Risca...sunshine!! The kiln was ready so the glaze firing started by 1.30pm! The Carpenter had ridden well in the Bristol Polo tournament, his team coming 8th(?) which was a good result. He has a few scrapes and bruises and a nasty cold as souvenirs, therefore a lift to work was deserved on Tuesday morning! On to finish the sheep, and that is sheep making finished for now until more stock is needed. At least the day wasn't so grey as Monday and again the sun came out as I reached home! Kiln unpacking was a little disappointing, as the new black glaze turned out a dark brown. An interesting dark brown...so this needs working on. Perhaps I underfired a little in trying not to overfire as I did on the previous glaze firing. The new red just isn't working which meant mixing a batch of the usual red glaze. Packing for the next firing started straight away! The platters are in this time! Hopefully the old red glaze will test ok, and the last firing will be mostly red! Today the kiln went on as dawn broke, still misty, to the sound of birds singing. The traffic noise soon drowned that out, but it was lovely to start with. The mist is hanging on, but with any luck it will lift later. Tredegar (fifteen miles away) was the hottest place in Britain yesterday, at 15 degrees C ! I'm itching to get back on the allotment, but firing the kiln comes first. I unpacked the kiln first thing this morning, and re-packed a glaze firing...but instead of lighting the kiln, I had a day off! I spent the day in the Abergavenny garden with friends, weeding, lifting (and washing) the last of the parsnips and planting onion setts. It has been a glorious day spent well in good company and a meal shared as the afternoon turned a little chilly. The smell of clean line-dried washing. The smell of fresh sunny Spring air. The smell of a fired, cooling bisque kiln. The kiln went a bit too well! Two salt pots and two flared mugs have a little...ok, a lot!...of small bloats all over. I pot mini cones 9 and 10 by the glaze test pots...cone 10 was flat!...oops. I'm not packing tight to the back wall, so that shouldn't have happened, but it does show the worth of putting extra cones around the kiln. At the front spyhole cone 10 was just softening, at the pyrometer ( in the middle of the kiln roof) it was 1275. Peter's Red Tenmoku came out a luscious black. The Joe Koons red I got from a post by Mel Jacobsen on Clayart forum looked overfired..and that is a cone 11 glaze. I made a Nuka glaze including woodash from the stove in the gallery and where thick enough that is a beautiful white. That is apparently good with a light coating of a Tenmoku glaze over it. So, "onwards and upwards"" as they say. The platters are sitting in the warm kiln to speed drying a little and I've got two hours to glaze a few more pots and mix more glaze. All done and dusted by 9pm, including the crash cool to 1000 Centigrade. Apparently this improves iron glazes, obviates quartz crystal inversion problems ....and best of all I should be able to open the kiln between 11 and 12 noon tomorrow!! After much glazing and sponging of feet the kiln was packed and lit just after 1.30... lunch was very welcome indeed! It has turned a little warmer and is still breezy, which means that a full line of washing is out drying, along with the four big platters...at last!! I'm glad it is dry as the Carpenter is commuting to Cardiff on his bike and I've been lending him my kit to ride in as he'd run out of clean kit!! Back to check the kiln now and carry on glazing for the next firing. I'll be glad when The Wizzard and The Carpenter have finished sorting the laptop and the computer...then I'll be able to post pictures as well as words. one of those days when starting is the hardest thing to do! Today started wet, now it is blustery and showery. The sort of day that if you peg clothes out on the line, you need clean hands at the ready to bring them back in again fast.... so they are going on a clothes rack indoors! I've just done another batch of sheep , lets hope they sell like "hot cakes" over the Easter holidays!! I arrived earlier and just worked straight through today...and paid for it by forgetting my spare specs. Not to worry, I'm using my spare, spare specs....having mislaid the new pair last October after only having them for two months. Bother!!! The platters were just right to have their feet turned and cut . I put holes in the feet as well so that they can be hung on a wire against a wall. Plate hangers ruin rims!! Everything has been finished, now I have to be patient in drying them before firing. The nights have turned cold again- I had to scrape the ice off the car windows this morning. At least it has been pleasant and sunny during the day. Although we do need more rain to replenish the ground water it is a relief to be able to dry pots and clothes outside and to get on with gardening too. Time to clear the decks and sort the glazes. I'll do a few glaze tests as I've been a bit lax on them lately. I like to have at least one test in every glaze firing. It started wet and windy today, then carried on with showers and blustery wind- but nothing like the tornadoes in the USA, thankfully. No going for walks or gardening, it was "nose to the grindstone" day...kiln unpacked and re-packed, fettling as I went, and on by 12.30. I don't usually work in the workshop when I'm firing, but as soon as the flue was drawing well it was carry on turning! A board full of ordinary size bowls and two bigger bowls, then three vases for light turning to tidy up and adding handles. I needed a break as my hands were aching!! Follow that by brushing slip on four large platters before stopping to get supper on the way. I'm using a calligraphy pen to sgraffito writing around the rim of the platters. Two done, including an alphabet (always popular), and two to go.. Firing the kiln was "interesting" in a draughty workshop as the gusts increased the air supply!! It was easier as the kiln gained temperature and the gusts had less effect on the flames. Firing finished at 6.50pm. Taw cwpla peth sydd ora"
That completing the thing is best"
On that note, I'll go and finish the other two platters!! On emails..Having been busy for a few days- they do build up!! Thursday was a different day- four hours of (paid!) gardening. The grape vines are tidy and a few wires need fixing. A huge amount of pony manure got stacked and some spread around the roses. Then I cut back the jasmine/grape vine/ivy/clematis by the salt kiln so we don't have to fight the undergrowth- or over growth! Most of the plant-pots got sorted too. Then I collected a load of manure for my allotment on the way home. They are looking forward to the ponies going out in the Spring so that they don't have stables to clear!! Friday, and I was off again- and this time the right tooth crown had arrived at the dentist! Then a quick cuppa with a friend and back to finishing bowls. This morning I've done Usk Farmers Market. The weather has changed and it is rainy/sunny/windy in quick succession. Not a bad market, but we're all hoping for better weather and more customers.